Who’s going to get the farm? And what are they going to do with it? Will your future plans for your lad create harmony or strife for your family? Or have you even started to think that far ahead? 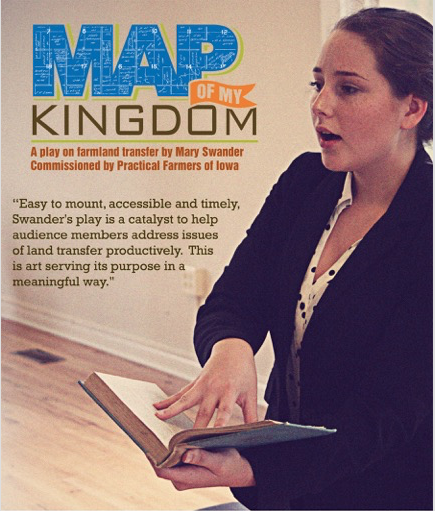 * Map of my Kingdom is a play commissioned by Practical Farmers of Iowa and written by Iowa’s Poet Laureate Mary Swander. It tackles the critical issue of land transition. In the drama, Angela Martin, a lawyer and mediator in land transition disputes, shares stories of how farmers and landowners she has worked with over the years approached their land successions. Some families almost came to blows, struggling to resolve the sale or transfer of their land, and dissolving relationships. Others found peacefully rational solutions that focused not only on the viability of the family, but also of the land.